Dante portrayed Hell as stretching down to the center of the Earth. In ancient times, people believed that Hell, or the land of the dead, was a physical place that could be traveled to. 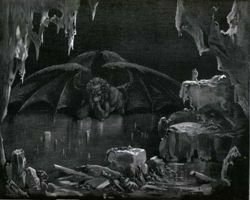 Greek heroes such as Odysseus, Orpheus and Hercules were all able to reach Hades and return to the land of the living, while Dante's Inferno portrays the Christian Hell as a subterranean pit that stretches down to the center of the Earth. Now that a complete map of the world has been built up through exploration and aerial and satellite photography, we of course know that Hell is not a physical place of the kind that people used to believe in. However, Hell remains an important part of theology: it does exist, and people (or their souls) do go to it and inhabit it. My question is, what is the nature of Hell's existence? Does it occupy a "spiritual realm", similar to the "alternate universes" or "parallel dimensions" that are conceived of in science fiction? If so, is this realm subject to the same physical laws as our own? For example, do light and sound exist there? Naturally, we cannot know the answers to these questions for certain. But I would be keen to hear the views of others, so I invite anyone with comments, theories or insights to post them below. Thanks to all who have responded so far. For the benefit of all readers, only comments strictly relating to the question will be kept here indefinitely - for a record of all comments, please see the talk page. The answer to this question is quite simple and not a mystery at all. Hell simply doesn’t exist, either physically or in any other form, such as alternate universes. Hell is merely a concept, a figment of the imagination. You are very right when you say hell is not a physical place on earth, just like heaven isn’t a physical place in the sky. These are just ideas that exist in the minds of people. We need something to either look forward to or fear, and churches around the world recognized that and this also serves as a way to keep people in check, to establish moral values. You can either live a good life and be rewarded in heaven, or a sinful life and be punished in hell. But the reality of it is, this is the only world we exist in and we must make the most of it now. We can’t be bogged down our entire life trying to make it to heaven. We need to just enjoy life. Because we might be very disappointed when there are no white gates greeting us after we die. But, if there is a hell, just keep the old saying in mind: Hell for company, heaven for climate. – Conservativedude. Hell exists and no one escapes it by pretending it isn't there. Some get a glimpse of it at times in their life, but the full horror is far worse [...] I don't know anyone who sincerely denies the existence of the unseen, the spiritual, etc. Sure, there are materialists who will play the fool and claim nothing unseen exists, but I doubt they even believe that. An interesting discussion, and so one that I'll put my two bob's worth into. I don't have any real issues with CPalmer's opening paragraphs, but will quibble about one minor point. He says that "we of course know that Hell is not a physical place of the kind that people used to believe in.". Well, no, we don't know that, for certain. Just because we've mapped most of the Earth (there's some parts that are not well explored, especially including to ocean bottoms), doesn't mean that it couldn't possibly exist on Earth, and neither does it mean that it's not a physical place somewhere else in the universe. I'm not claiming that either of those are the case, however. Conservativedude's response is little more than unsubstantiated opinion masquerading as argument. His only attempt at support (that hell was invented to control people) is itself unsubstantiated polemic. I have quite different views to Ed Poor, so I won't comment on Conservativedude's reply to him, and I think some of Andy's comments are not ones that I would make, so I also won't respond to most of Conservativedude's reply to him, except that I will point out that his question, "How can they go to a place they have no concept of?" is nonsense. If you discover a native in the jungles of the New Guinea, for example, who has no concept of Australia, does that mean that he can't go there? Of course not. All it needs is for someone to take him. Is hell a physical place? We are told that when we go to Heaven, we will receive new bodies. From a science fiction point of view, "body" usually indicates something physical, as opposed to a non-material being. And the same seems to apply in the Bible. God is a bodiless spirit, but when He came to Earth as Jesus, He did so with a physical body. So likely that new body will also be physical. This is further supported by a reference (I'm sure, but I don't recall where) about Jesus' wounds (from the cross) still being visible in Heaven. Nevertheless, I believe that there remains the possibility that the new body will not be a physical one. But if it's physical, then this implies (requires?) that Heaven itself be a physical place. And I believe that this is how most Christians understand it. Although some references to it in the Bible may be symbolic (streets paved with gold, for example), many references do imply something physical about it. That therefore suggests (but doesn't prove) that hell is also a physical place. However, there is also the possibility that that will be one of the horrors of hell—no bodies! I don't think this discussion on the location of hell can avoid the question of the nature of hell, so I'll address that. Just like the story of the blind men who describe an elephant in quite different ways because they are feeling different parts of it, I believe that there are a number of characteristics of hell that appear to be quite different yet really are talking about the same place. One way of looking at hell is that it is nothing more or less than the place where God isn't. That is, there may be no actual punishments, tortures, or the like there at all. The torment will be nothing more than the absence of God. However, as God is the creator of everything, and the Bible tells us that God "... is before all things, and in him all things hold together." (Colossians 1:17). So what happens when everything that God has provided—our bodies, our friends, our ability to love, our curiosity, etc.—are no longer held together by God? Simply being somewhere that God is no longer "holding together" would have to be the worst torment of all—without God actually doing any tormenting! That is, those people who have rejected God have simply gotten what they wanted—existence without God. But of course this doesn't mean that all those "horror stories" about how bad hell is are nonsense. Hell is a horrible place, but only because God isn't there. So does that mean that it's a place of eternal punishment, or not? I guess that depends on how you define "punishment". If "punishment" is defined as the consequences of your actions (rejecting God, in this case), then yes it is. Turkmenistan, Tajikistan, Eritrea, North Korea, Syria, Iraq, Iran, Mauritania, Saudi Arabia. This page was last modified on 25 May 2017, at 18:13. This page has been accessed 8,116 times.